StowPod The Transferable Storage Pod. 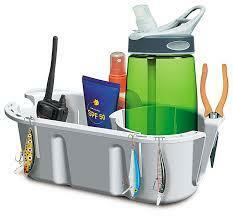 What do pliers, keys, fishing lures, cellphones, VHFs, binoculars, drink bottles, sunblock and mugs all have in common? The RAILBLAZA StowPod Storage Caddy will hold them all safe and secure. If you want storage on your pushpit, rail, console, pedestal, inflatable tube, gunwale, or almost any surface, then the StowPod is for you. This unique design incorporates a movable partition, transforming one end to a drink holder, or leaving the entire pod open to hold larger items. • Easily removed and stowed when not in use or transferred to another position.